by the visual and audio poetic tone "
between man and nature "
To the Inuit of Qaanaaq, 1,200 miles above the Arctic Circle, “Sila” is the weather, the sky – “all that is out there.” From a remarkable opening sequence to interviews with Inuits, whose language sounds like it has been chipped from ice, director and cinematographer Corina Gamma uses superb images, restrained but forceful editing, and Jorge Corante’s music to show us a world where Sila is slipping out of balance, while a team of international scientists tries to find out why, the Inuit struggle with its consequences. “Here on the 25th of October, the sun sets for the winter. On the 17th of February, the sun rises again… Ice and sun has made our life”. 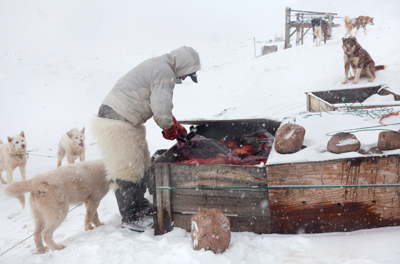 And that is changing, in this fascinating exploration of the daily lives of the Inuit. 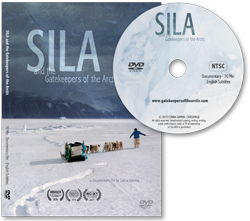 “Sila” in Greenlandic connotes the weather, the universe and all consciousness and “Sila” the documentary concentrates on the disorder of Sila due to global warming. It also explores a team of NASA funded researchers at SWISS CAMP, lead by climatologist Konrad Steffen, who measure the climate on the ice to aid our understanding of the past and predict the future. A lone child swings on a rope in the ice, dogs pant as they run, men fish in their frozen desert, birds circle the sky; director Corina Gamma’s images capture Arctic culture in an elegant, humanistic way. Thankfully we are not overwhelmed with scientific jargon, but instead we are presented with a form of effortless documentary-making that invites you to learn and share its fascination with the beauty of the natural world. Considering the grim premise of climate change, “Sila” succeeds by advocating the ethereal connection between man and nature.